He’s in his 70s now, and has suffered from serious illness for years. 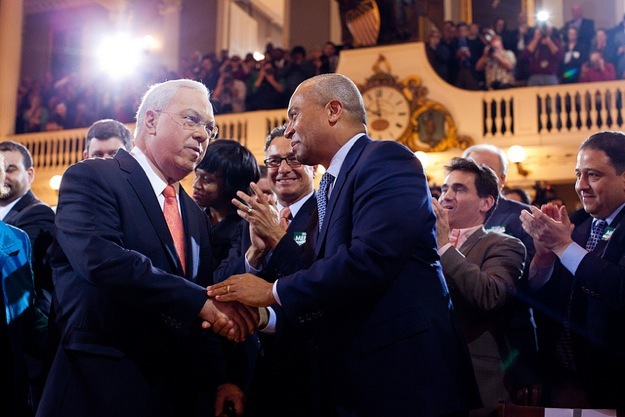 Even so, we were all stunned on Saturday night when The Boston Globe reported that former Boston mayor Tom Menino, just a few months into his working retirement, has advanced inoperable cancer. It sounds hollow to indulge in clichés like “he’s a fighter” and “he can beat this.” Of course, everyone hopes he responds well to treatment and is able to enjoy a high quality of life for as long as possible. But I think it makes the most sense to wish the mayor and his family our best and keep them in our thoughts — and prayers, if you’re so inclined — as he begins this final chapter of his life. Photo (cc) by Eric Haynes for the Office of Gov. Deval Patrick and published under a Creative Commons license. Some rights reserved.